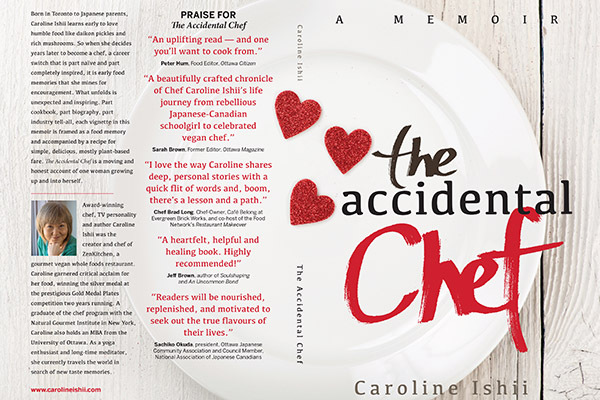 Ottawa chef and author Caroline Ishii shares what’s next on her plate. Photo courtesy: Caroline Ishii. There are certain foods and smells that can evoke strong and vivid memories. Barbecue reminds you of Canada Day parties, vinegar takes you back to making sushi with your grandmother or chow mein reminds you of your mother bustling around the kitchen. These are what Caroline Ishii calls ‘taste memories,’ and what she uses to tell her stories in her memoir, The Accidental Chef: Lessons Learned In and Out of the Kitchen. “We eat a lot every day, but there are certain foods that we eat and it evokes an emotional response, and remembrance. That’s what I’m fascinated by and that’s the kind of food that I captured in the book,” Ishii tells Nikkei Voice in an interview. Ishii is a sansei, and award-winning chef who opened the restaurant, ZenKitchen in Ottawa in 2009, centred on creating healthful and mindful vegan fine cuisine. Her journey to create the restaurant was chronicled on a television series called The Restaurant Adventures of Caroline and Dave on the W Network. In her memoir, Ishii delves into memories of her childhood, her parents and journey to become a chef and open her restaurant. At the end of each chapter, she anchors the story with one of her recipes, so the reader can experience her taste memories for themselves. Despite being a chef, and the memoir including Ishii’s recipes, it is not a cookbook. Instead, Ishii honestly and frankly shares distinct memories and experiences in her life, shaped around specific foods. “I didn’t want people to think this was a recipe book. There are a lot of cookbooks out there, and you can google anything, so it wasn’t a recipe book. This is a book about my stories about food, and then by the way, there is a recipe that you can share,” explains Ishii. One of Ishii’s most vivid memories, she shares in a chapter called ‘Cookies for You.’ Ishii recounts as a child, going to a deli with her mother. Women at the deli were gathered around the owner, holding a plate of freshly baked cookies. The women all turned and stared at her mother, who without saying a word, grabbed Ishii’s hand and pulled her out of the deli. “I was six or seven years old and I still remember that memory as it was yesterday, I could replay it in my head, and I have replayed it all my life,” says Ishii. At the time, Ishii says she couldn’t understand what happened or why. What she did feel was the embarrassment, hurt and shame her mother did. It was not until years later, when Ishii reflected on the memory, did she realize the blatant prejudice that she witnessed her mother experience, she says. Ishii closes off the chapter with a recipe for her thumbprint cookies that she imagines sharing with her mother now. Writing her memoir was a way ‘taste life twice,’ says Ishii. Experiencing memories again gave her a stronger understanding on her parents, why they made the decisions they did, what they couldn’t say – and the sacrifices they made for her. Both of her parents were excellent cooks, says Ishii. Her father used to cook for the U.S. Army and her mother had a deep love for cooking that she passed on to Ishii. Another of Ishii’s fondest taste memories was tasting her way through Japan with her mother. For Ishii’s latest project, she is putting together a book about Canadian cuisine to be published by a Japanese publishing company that focuses on healthy, vegetarian lifestyles. The new book has made Ishii pause and reflect on what Canadian cuisine is, and how to take a vegan angle on it – a task easier said than done, but one she is excited to jump into, says Ishii. “It’s not just Maple syrup. We know what it’s not. It’s not just bacon, right? But what is it?” says Ishii. Ishii has worn many hats throughout her career; marketing and business, public relations, chef and now author. In the last era of Ishiii’s life, she left the restaurant she started from the ground up and ended her marriage with her husband and business partner. Since then she has been travelling, reflecting, tasting and writing. Visiting Hawaii, Japan, Thailand, Bali, Vietnam and Laos, Ishii started in Vietnam to stay with a friend and then let opportunities and intuition guide her the rest of the way as she tried to decide what’s next. “I’ve just gone to start to figure out who I am, again. If I don’t have the restaurant, who am I? It takes a while to figure out, and any transition takes a while,” says Ishii. Staying opened to all opportunities, Ishii found herself in Vietnam helping to open a cooking school because of a connection she made while traveling, Ishii says. Since then Ishii has been teaching, writing and trying out opportunities that come her way. Just recently, Ishii took part in a chef challenge with CBC Radio to create a Canada Day dish incorporating local ingredient from different provinces and territories. (For more on that, read Caroline’s blog here). 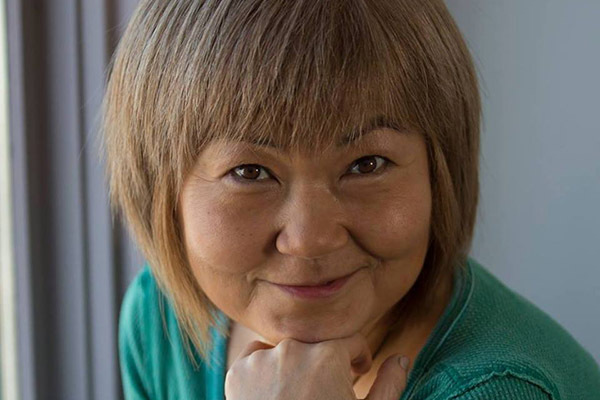 While Ishii looks for what’s next in life, she continues to blog, prepare for her next book, and will be speaking at the NAJC conference in September about being Japanese Canadian.